and some contestants have been banned for steroids. Is it good for your MS? ProfG asked this of us and so is this the answer that would occur in humans? Would climbing up an 8m ladder carrying 45kg be stressful? 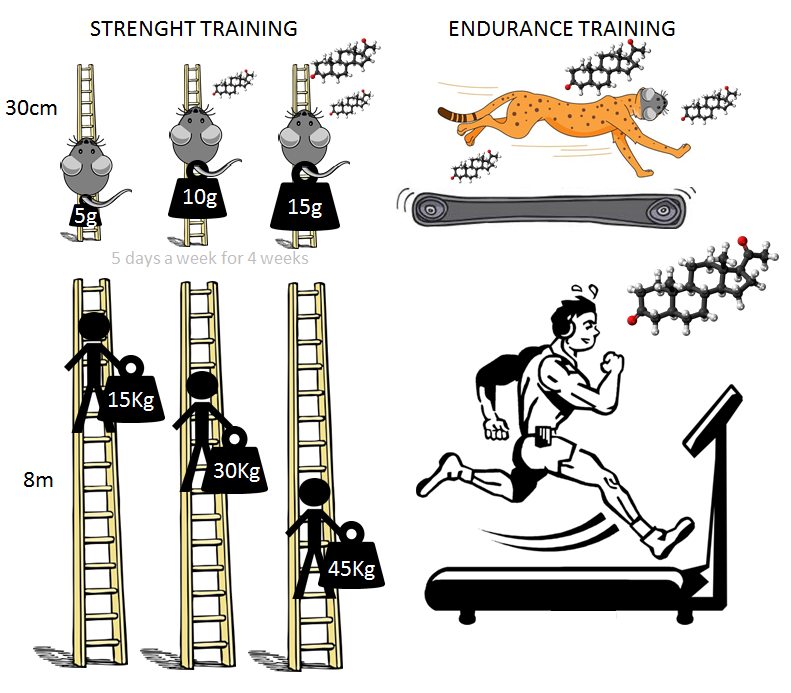 Should we use animals for this and how should we develop the exercise plans relevant to humans or should we simply just do the studies in humans? 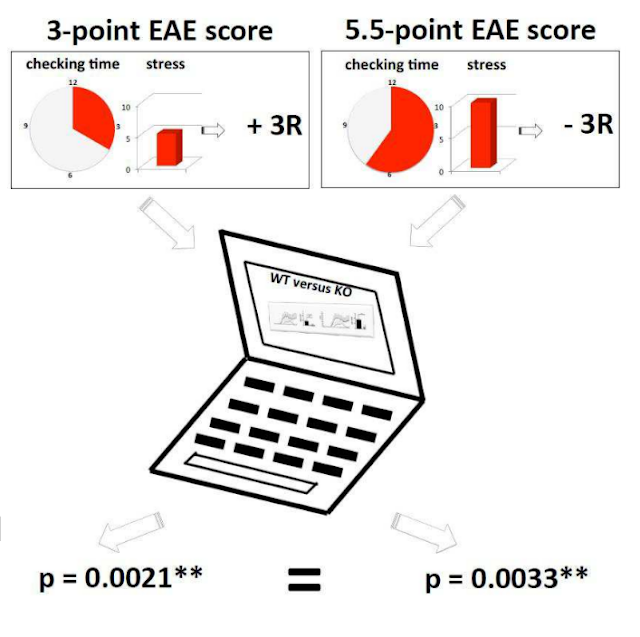 I will point out that there have been EAE studies were a voluntary exercise wheel was used to similar results. Souza PS, Gonçalves ED, Pedroso GS, Farias HR, Junqueira SC, Marcon R, Tuon T, Cola M, Silveira PC, Santos AR, Calixto JB, Souza CT, de Pinho RA, Dutra RC. Physical Exercise Attenuates Experimental Autoimmune Encephalomyelitis by Inhibiting Peripheral Immune Response and Blood-Brain Barrier Disruption. Multiple sclerosis (MS) is a chronic inflammatory disease of the central nervous system (CNS) caused by demyelination, immune cell infiltration, and axonal damage. Herein, we sought to investigate the influence of physical exercise on mice experimental autoimmune encephalomyelitis (EAE), a reported MS model. Data show that both strength and endurance training protocols consistently prevented clinical signs of EAE and decreased oxidative stress, an effect which was likely due to improving genomic antioxidant defense-nuclear factor erythroid 2-related factor (Nrf2)/antioxidant response elements (ARE) pathway-in the CNS. In addition, physical exercise inhibited the production of pro-inflammatory cytokines interferon (IFN)-γ, interleukin (IL)-17, and IL-1β in the spinal cord of mice with EAE. Of note, spleen cells obtained from strength training group incubated with MOG35-55 showed a significant upregulation of CD25 and IL-10 levels, with a decrease of IL-6, MCP-1, and tumor necrosis factor (TNF)-α production, mainly, during acute and chronic phase of EAE. Moreover, these immunomodulatory effects of exercise were associated with reduced expression of adhesion molecules, especially of platelet and endothelial cell adhesion molecule 1 (PECAM-1). Finally, physical exercise also restored the expression of tight junctions in spinal cord. 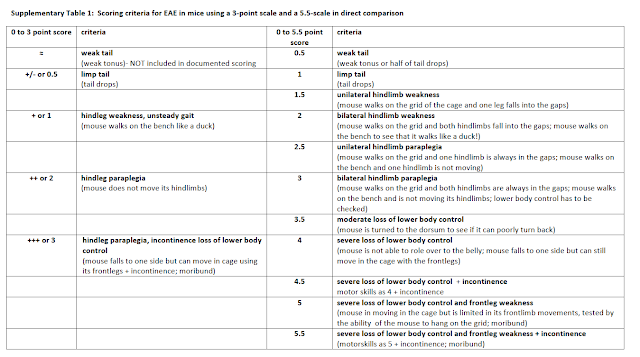 Together, these results demonstrate that mild/moderate physical exercise, when performed regularly in mice, consistently attenuates the progression and pathological hallmarks of EAE, thereby representing an important non-pharmacological intervention for the improvement of immune-mediated diseases such as MS. Graphical Abstract Schematic diagram illustrating the beneficial effects of physical exercise during experimental model of MS. Physical exercise, especially strength (ST) and endurance (ET) training protocols, inhibits the development and progression of disease, measured by the mean maximal clinical score (1.5 and 1.0, respectively), with inhibition of 30 % and 50 %, respectively, based on the AUC, compared with EAEuntreated group. In addition, ST and ET decreased oxidative stress, possibly, through genomic antioxidant defense, Nrf2-Keap1 signaling pathway, in the CNS. Physical exercise inhibited the production of inflammatory cytokines, such as IFN-γ, IL-17 and IL-1β in the spinal cord after EAE induction, as well as spleen cells obtained from ST group showed a significant upregulation of regulatory T cell markers, such as CD25 and IL-10 levels, and blocked IL-6, MCP-1 and TNF-α production, mainly, during acute and chronic phase of EAE. Finally, these immunomodulatory effects of exercise were associated with inhibition of adhesion molecules and reestablishment of tight junctions expression in spinal cord tissue, thereby limiting BBB permeability and transmigration of autoreactive T cells to the CNS. NO, nitric oxide; GPx, glutathione peroxidase, GSH, glutathione; Nrf2, nuclear factor (erythroid-derived 2)-like 2; CNS, central nervous system; BBB, blood-brain barrier; IFN-g, interferon-gamma; IL-17, interleukin 17; IL-1b, interleukin-1beta. However on a lighter note, the UK Home office and the European Union now enshrines the 3Rs (Reduction refinement, replacement) of animal use as part of use of animals in research. Refined clinical scoring in comparative EAE studies does not enhance the chance to observe statistically significant differences. EAE is one of the problem areas because it is considered “severe” because of what happens to the beasties. 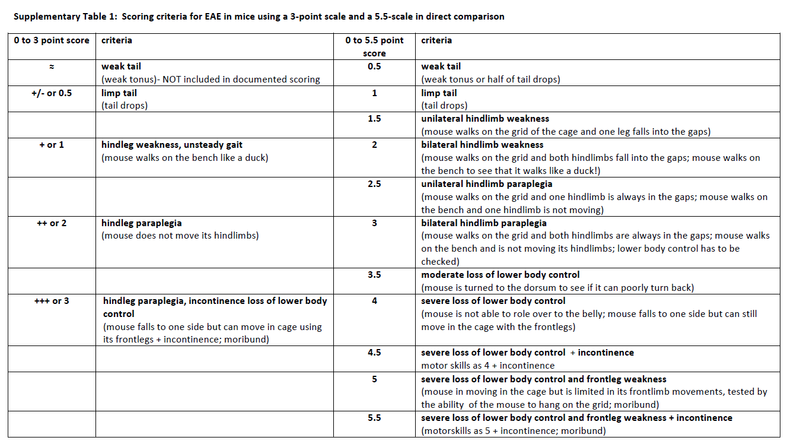 So in this study they look at the common or garden EAE scoring system and ask if they attempt to 3Rs-it and put more elements into this does it improve this? Our vet asked do the beasties get headaches when they get EAE?…my response was they had never told me that they do). But it is not always so frivolous, spending our nights checking the beasties at the behest of the Whim of Home Office or Vet is no fun. However, you can make it very complicated and have say a 16 point score. There was once a study used to justify a clinical trial when there was clinical score or a difference of 2.5 verses 3.5 P<0.05 but when you realised the scoring system was 0-16 and this meant the drug changed a partially limb tail to almost a partially limp tail and the group sizes had over 100 animals in them, you say “Where is the 3 Rs in that?” and the effect is so marginal to be non- existent…trial failed. Therefore the “smack you in the eye test” is an useful part of data analysis. 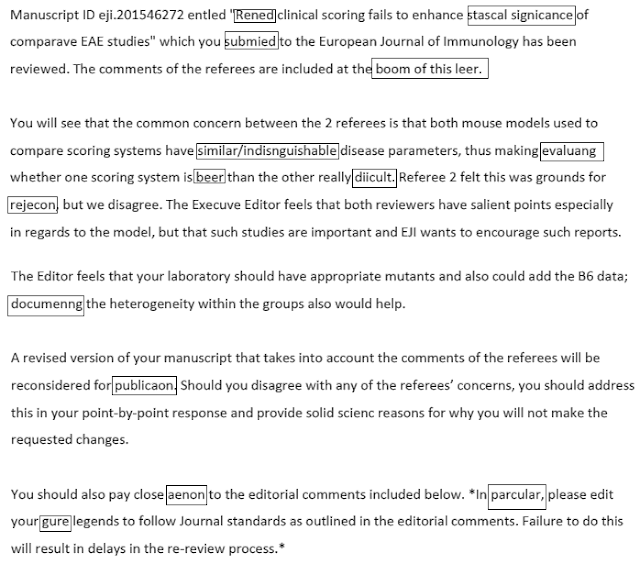 However what is interesting is the comments of the referees are on show for this journal and they complained that the scores were around 1 for the score 0-3 score and about 2-3 in the 5.5 saying the disease was mild and so perhaps lacking a quality control element if more severe disease is the norm. 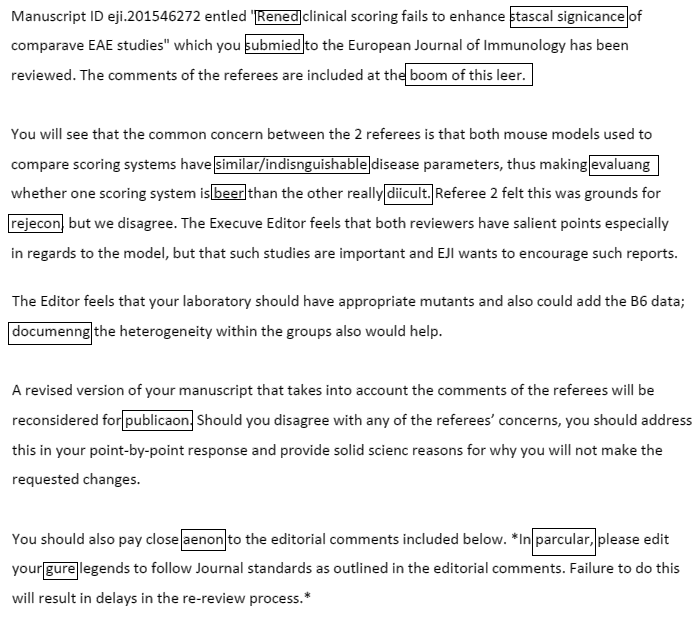 The best bit however was the letter from the Editorial Board (cpoied form = copied from:-) their online pdf). It is nice to see that their Engrish is up to scratch. Not Interested in Animal Stuff. No problem Don’t read! Is there any way I could get a doctor's note saying that I need time out every day to exercise? > We all know that exercise is good for you. Do you have evidence of long-term safety in MS, Mouse Doctor? Hehe, no you don't. Well what I see is that people who can still exercise seem to do better about MS than those who prefer to exercise or who just can not decide not to exercise the consequences, the very activity of the disease. Interestingly, all I know, who do intense physical activity and well, NEDA and without compromising consequences, or are body builders, water marathoners or triathletes and race. This is why profG wanted us to to the experiment was to see if it promoted progression. However a modest bit of exercise may be a different thing in a few weeks we will see some people with ms in action in the Paralympics tell them not to exercise. A neuro once told me what about if he happent to fall, have an accident, or an sport lesión, probably if he is in good shape and doing excercise (he is not :D) he then have a better chance of doing a full recovery. I like to aply this to my MS relapses. I know its not to what this post is about but i think its a valid point anyways. Oh went to the male soccer games yesterday in the Amazon Arena, Japan x Nigeria and Sweden x Colombia. Oops, must have gone wrong time to write a "Army" and "wque". in fact it would be "exercise" and "that". It can only help I'm sure based on my experience… was bound to the wheelchair for a quite a few months and really got better after receiving Tysabry back in 2008. It was only through physio theraphy that i recover mobility and use of my legs, and while it took me a while (years) to properly walk again and improve my bladder and bowel control, senation on my legs, etc. Last October I completed the Australian National Duathlon Championships and came 5th in my category. Ran a 17:20min for the 5k and could not be happier. I have changed therapies since 2008 when it all started, and have had other relapses too. Now on Alemtuzumab, b one thing I can say is that is only through sports and challenging myself physically everyday that I have been able to deal with everyday MS and continue to improve… on December the 4th will be completing Busselton 70.3, can't wait !